Nebo’s Bluevale Station has sold under the hammer at auction this week for $5.6m to Central Queensland beef producers Richard and Diane Hughes of Wentworth Station, Clermont. 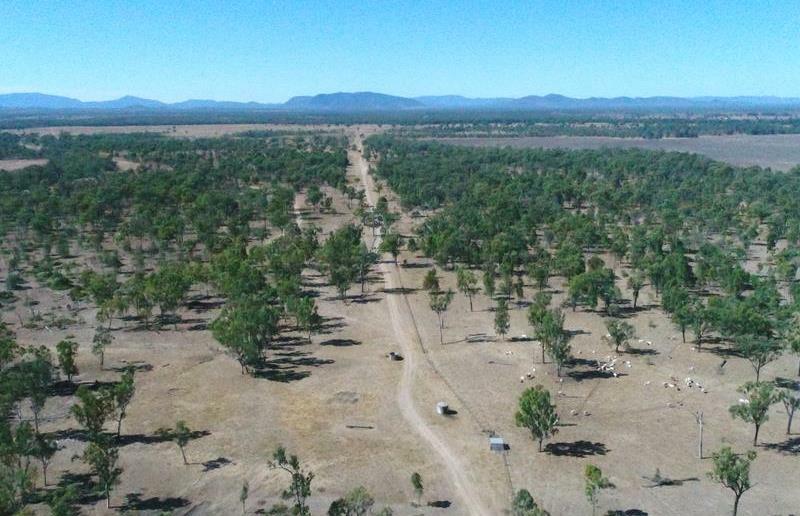 The 3251ha property, pictured above, located in Central Queensland’s Isaac River catchment, was offered on a walk-in walk-out basis with full plant and equipment and 750 branded cattle. The vendors, Graham and Linda Huddy, are downsizing after nine years of ownership. Bluevale is well-grassed breeding, background fattening country that can carry up to 1000 mixed cattle. It consists of cleared belah, brigalow, box and blue gum flats growing buffel, stylo, black speargrass and Indian couch. There is 1400 hectares of cultivation, including oats or forage sorghum. The property is well watered by the Nebo Creek, three bores and two water licenses totalling 61 megalitres. Peak Downs Highway frontage offers year-round access to the yards and extra income is derived from the hardstand currently leased to Thiess Australia. Selling agent Robert Murolo from Elders said the main interest came from producers seeking expansion and chasing grass. “The five bidders were locals, within a 200km of Bluevale, and were attracted by location, the water and its mixed operations,” he said. The renowned Southern Riverina river frontage property Emu Park has been sold for $7 million bare, after a competitive expressions of interest campaign run by Matt Horne from Elders Deniliquin. The 4353ha breeding and fattening property, located 30km west of Deniliquin and 90km north of Echuca/Moama, was offered to the market for the first time since the early 1940s. Emu Park has a rich history of producing some of the finest livestock and wool clips in the Riverina. It was originally purchased by C.H McDonald & Sons to operate in conjunction with their other Riverina holdings, which included Old Cobran, Whittier Park, Myrtle Downs and Glenco. The property is generally flat with soils comprising red to grey clays suitable for a broad range of farming pursuits including beef production, prime lambs, fine wool, winter cropping and horticulture. It boasts 9km dual frontage to the Wakool River and 4.5km single frontage to the Yallakool River. The river country is ideal for the breeding and fattening of livestock and offers excellent shelter. Under the management of well-known Riverina producer, Joyce McConnell, Emu Park supported 3500 Merino ewes, 200 Hereford breeders, 200 steers and 200 replacement and surplus heifers. Mrs McConnell (who has retired to Melbourne) and her sisters, Claire Vance and Margot McDonald, sold their family’s final holding to the Day family from Oaklands who will run a large proportion of their breeders on Emu Park. Barcoo River property Prairie Downs was passed in at auction for $2.525m. Ray White Rural has passed-in the quality Barcoo River property Prairie Downs at auction for $2.525m. Located 70km north-west of Blackall and 50km east of Isisford, the 6293ha property is well-watered, boasting 9km of Barcoo River frontage, seasonal water holes in the Douglas Ponds system to the east and a capped artesian bore reticulating throughout the property. The country comprises a mixture of Barcoo River country, developed gidgee and lightly shaded downs and can conservatively carry 800 dry cattle.